Several dozen people, most of them Likud activists, rallied across from the Defense Ministry's Tel Aviv headquarters in support of Operation Cast Lead in the Gaza Strip. The offensive entered its fourth day Tuesday. The activists carried signs urging Tel Avivians to "wake up before Hamas gets here." A disagreement broke out between the protestors as some hoisted signs reading "Israel's Arabs – the IDF is defending you too": "Israeli Arabs are a fifth column. They support Hamas and I do not support them," one of the activists told Ynet. 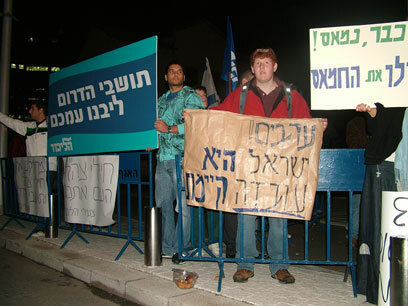 Knesset Member Gilad Erdan (Likud), one of the rally's organizers, urged cooler heads to prevail and the sign was not used. Erdan said that the rally's purpose, other than to show support for the fighting forces in the south, was to get the people in Tel Aviv involved: "We want to give the IDF the feeling that the people of Israel are united in their support of the armed forces, as well as to refute the sentiment that Tel Avivians are oblivious to what's going on." He also expressed his hopes that the government would stand by the operation's goals. "Even if there are some political interests involved here, I would forgive them because all that matters now is reinstating peace for the residents in the south." See all talkbacks "Tel Aviv: Dozens rally in support of Gaza op"